The smallness of the New York City studio is the first thing one notices on entering. Everything is more or less within arms reach. A N/W corner room so close to Fort Tryon Park with the Cloisters and its Hunt of the Unicorn Tapestries that one even sees sky and trees. Size is quickly forgotten and the contents reveal themselves. A tapestry underway, a pile of finished pieces rolled up and waiting, a board leaning against a wall with sketches under consideration, cartoons and drawings being refined for possible future projects, tapestries tacked to the wall for consideration, a round table for working and meals, a radio and TV and the computer which Archie resists. Somehow there is also room for storage of yarns, books, tools, finished pieces packed away. This is a space of creative and productive energy. Tapestry is a journey for Archie which manifests itself in his approach to each unique tapestry and in his overall tendency to work in series over time. His use of a cartoon is influenced by what he’s going to weave. There might be no cartoon but just an idea or a rough sketch. He begins with no tonal concept. A cartoon contains only the placement of the major shapes. Fibers, tone, colors, expression within the shapes is left for the journey. Should it be woven top to bottom, bottom to top, side to side? Or maybe it works better set diagonally on the warp as in “wish I was there! Archie,” 2006 [AB56]. Often he will risk putting in something at the start that will force him to have to deal with a composition and balance issue later in the journey as in the light valued checkerboard that establishes the foundation for the Lymerer 2003 [AB75]. This keeps the journey alive and open. The series all develop as non-sequential and non-programmed processes. Archie constantly revisits and reconsiders content, components and themes of former pieces. “Has it achieved what I set out to do? Is it overworked? What more can I do with it?” It is this questioning as much as the idea that drives him. There is never a lack of ideas or a search for a new one, only how to control the ideas in his head. 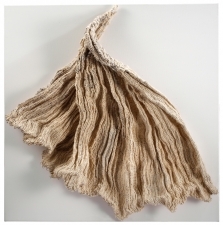 He does extensive preparatory work using sketch books, drawings, mockups, woven studies. Scale, sett and fiber are all carefully considered. When he has taken a piece from the loom it’s rolled up. He’s done. He’s ready to move on. It’s too soon to look at it and consider its “success.” He bounces around from one theme to another but finishes the actual weaving of a piece before beginning the weaving of another. He may also have a “sketch” loom nearby to try out ideas or find solutions. Much of what he weaves he considers a study as distinct from a “complete” piece. Archie only weaves for himself to satisfy a question that’s in his head. What had he been working on in the fall of 2008 when I visited him in his studio to begin this project? 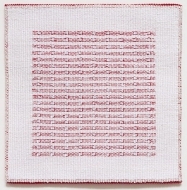 A small version of a tapestry that consists of words only. It is tacked up for consideration as he moves on to and completes a major piece. He re-weaves the words in a larger format reworking the “negative space” to strengthen readability and adding a few words to expand his statement. 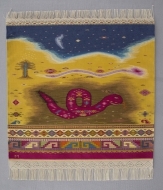 This space is never seen as a “negative” but rather as an inherent characteristic of and an opportunity to physically establish the cloth basis of the medium as one of the unique elements of woven tapestry. He plays with a drawing and weaves it and then weaves it again to make a major shift in the placement of the motif. He returns to an old theme and weaves a tromp d’oeil piece. Two events had a major impact on Archie’s early trajectory as a weaver and became the impetus to become director of the Dovecot and devote 10 years to public/private work that set the themes that he keeps revisiting. As an apprentice he had a chance to study some Coptic and 16th century Swiss German tapestries. Then as a postgraduate student in 1962 he saw the Devonshire Hunting Tapestries at the Victoria and Albert in London. They contain highly decorative fashions of courtly and humble people of the 15th century. The costume of a young man in a finely checkered tunic with a falcon’s hood hanging from his teeth in the “Falconry,” the second tapestry in the set, has had a major influence on his work. The thing what struck Archie was that one could express form via pattern alone without any modeling. 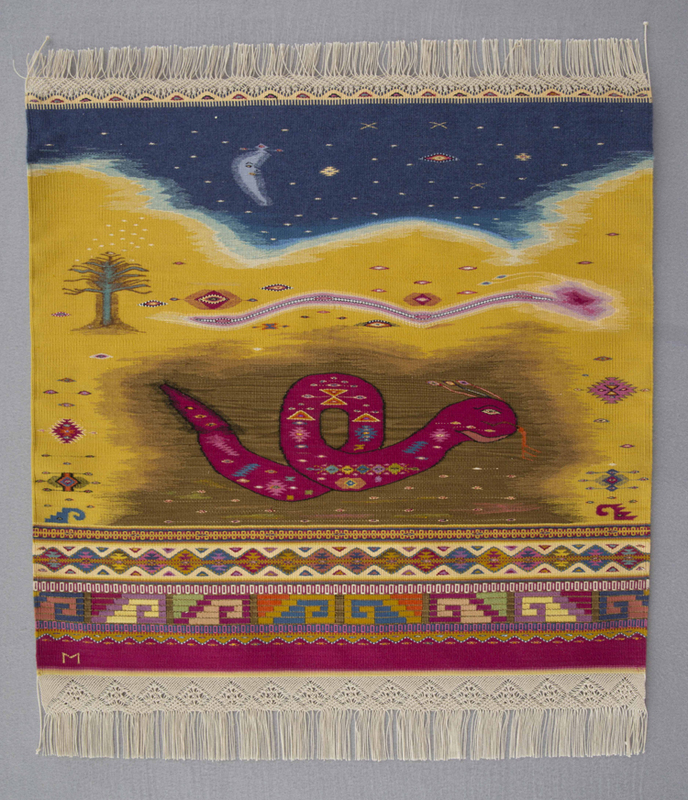 This changed his way of thinking about tapestry and led directly to “At a Window I,” commission, 1973, [AB22] featuring a polka dot dress along with various textiles and a very flat and stylized landscape. At this time he was Director at the Dovecot. He designed the piece weaving test sections as guides for the weaving team. It is a very significant piece bringing together many ideas that he has explored over and over. The second seminal moment connects with the first Lausanne Biennale around 1962. 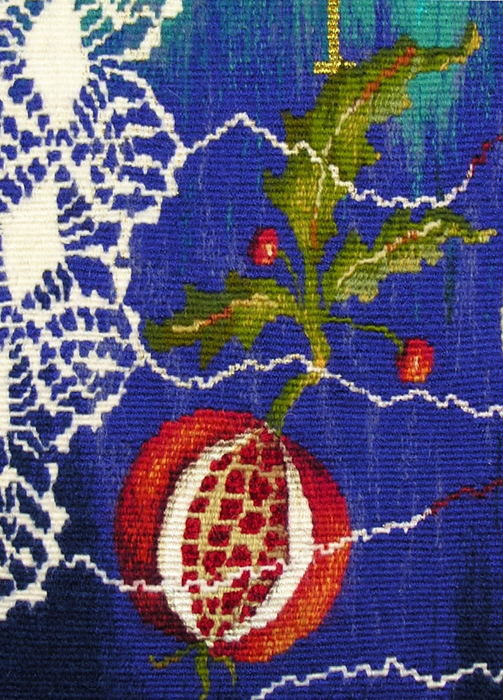 Sketches were submitted for jury and then an exhibition piece was woven. There was a 90 square foot minimum meaning only workshops and department heads could realistically participate. 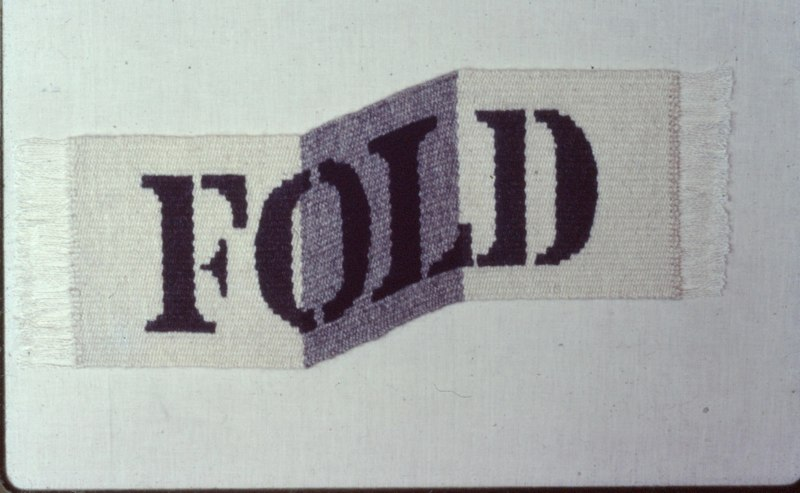 The Dovecot participated in this first Biennale with Hans Tisdale as designer. For the 2nd Biennale Archie designed the “Crucifix II,” 1965, [AB07] and the Dovecot with Archie wove the piece. It was a conversation at the opening of the 2nd Biennale that became the decisive moment that framed his future path. He was asked by Sheila Hicks, Magdalena Abakanowicz and others to take part in a group show in Prague devoted to be the “new wave” of fiber art. In his mind they were working to emphasize the tactile surface and structure of cloth as one of the medium’s inherent characteristics. It was seen by Archie Brennan as the equivalent in weaving to Jackson Pollock’s contribution to painting; as Peter Voulkos contribution of the plasticity of clay in ceramics; as Dale Chihuly’s emphasis on the reflective, plastic nature of glass; all as elements in the medium, the language, the vocabulary of a creative process such as music, poetry, dance, stone, print, metals, and so forth. He saw it as a rejection of traditional tapestry and he thought there was still so much more to say within traditional flat tapestry and that he was about flat/graphic/pictorial weaving and there were so many questions he had to ask about trying to keep all this as a living language. 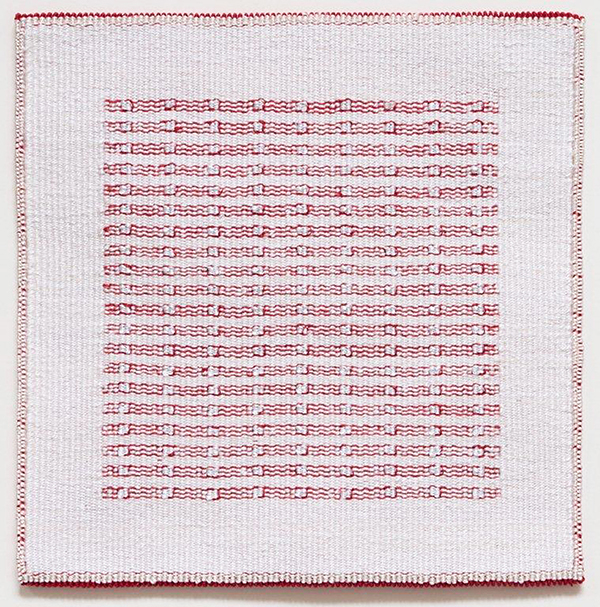 Archie wove “My Victorian Aunt,” 1967, [AB14] for the Prague exhibit as a way to say this is who I am. Unfortunately the weekend before the opening in Prague the Russians moved in and the event never took place. For the third Biennale Archie created the woven maquette “Present for a Cartoon Painter,” 1967, [AB17] which even though rejected was also a way of further defining who he was.